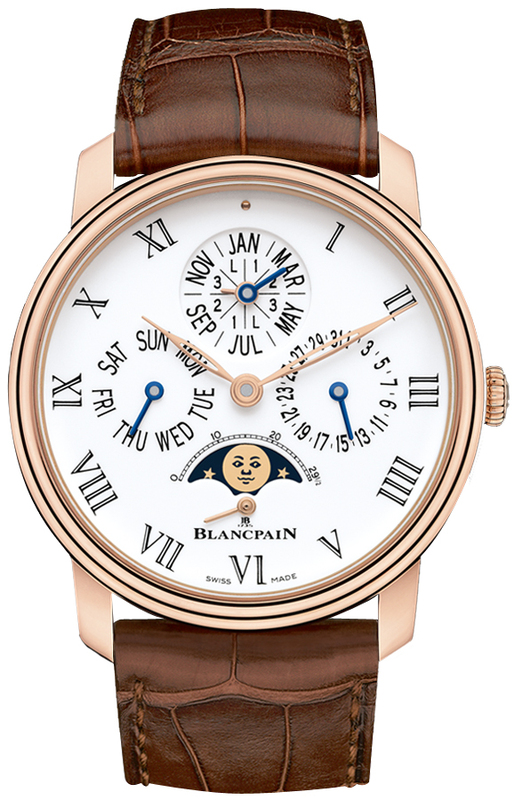 Full-fired "Grand Feu"white (slightly off-white) enamel dial. Stylized black printed Roman Numeral hour markers. 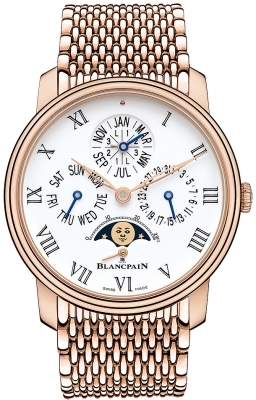 Elegant polished rose gold leaf shaped skeletonized hour & minute hands. 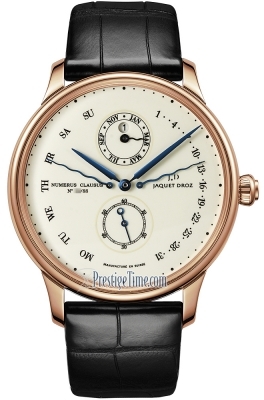 Small polished rose gold seconds hand located at the 6 o'clock position. 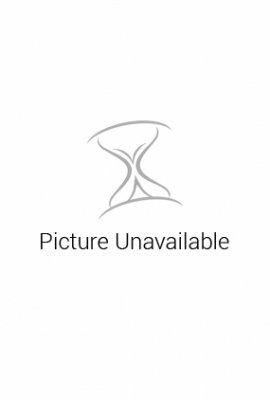 Unlike most calendar watches which have recessed pushers on the case edge & require a tool to adjust the calendar features, this watch has the corrector buttons hidden beneath the lugs on the case back of the watch. This allows for a clean/uninterrupted look of the case edge & also the buttons can be activated with ones fingernails. Also of note the 5939a movement features a revolutionary method for adjusting the indications without fear of movement damage, allowing for complete date changes regardless of the time of day. 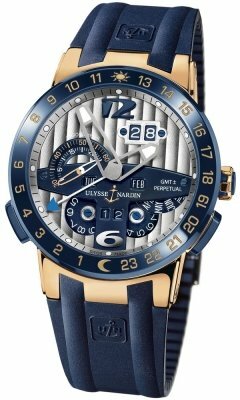 Day of the week sub-dial located at the 9 o'clock position (blued steel hand). 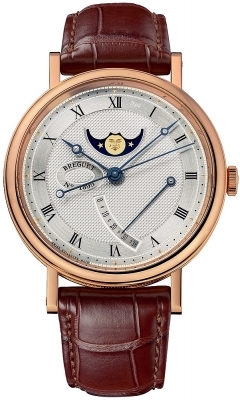 Date sub-dial located at the 3 o'clock position (blued steel hand). 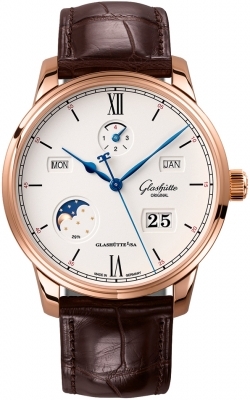 Month sub-dial located at the 12 o'clock position (blued steel hand). 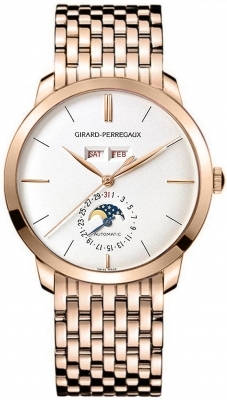 Leap year indicator located at the center of the sub-dial at the 12 o'clock position (polished rose gold hand). 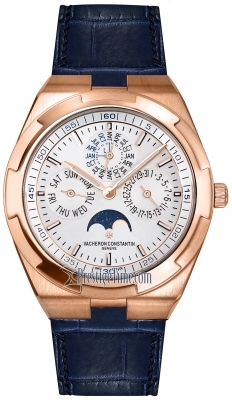 Moonphase display window located at the 6 o'clock position. 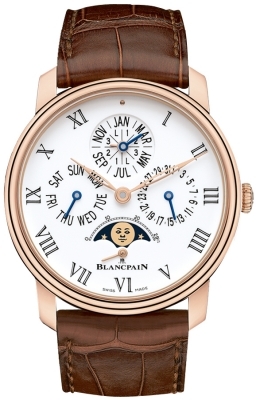 Blancpain Caliber 5939a, composed of 379 components, contains 42 jewels & has an impressive power reserve of 8 days (192 hours) - this is accomplished by a set of 3 barrels. Comes in a finely detailed wood "humidor" box with inlay decorations.